By exposing children to learn languages at an early age, you are giving them the opportunity to tap into their natural ability to hear and distinguish the sounds of other languages, and their capacity to make sense of what they are hearing. 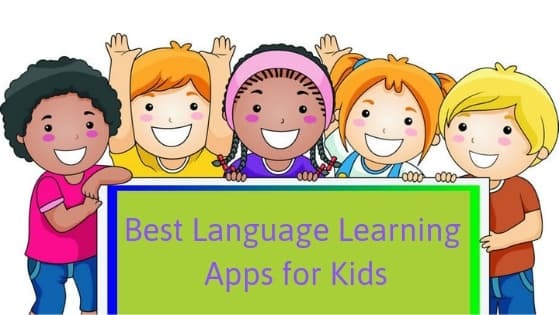 Take a look at our 10 language learning apps for kids that introduces language learning in a fun filled way. Explore a new language with Gus the friendly owl learning basic vocabulary concepts, interactive visual and auditory lessons, and more. Each completed lesson unlocks a fun game that reinforces what your child has learned. Country and city maps whiz your child across the globe to where each language can be found, where they will meet animals and learn food and clothing terms. Your kids will love the trophy room, where they can keep track of all of their achievements. Endless Spanish is a brilliant app that offer an engaging introduction to a new language with silly and charming monsters. They act out the meaning of the new Spanish words, using hilarious antics shown in short video clips. The app also uses animated letters and words to encourage kids to learn new Spanish words. Endless Spanish is a super cute monsters app that teach Spanish-language letter sounds. MindSnacks is a one-of-a-kind language game-based learning app. It features six exciting games designed to build essential vocabulary, reading, writing, listening and conversation skills, including an all new game to teach tones. Learn your verb endings and play fun games as you pick up a new language on the go. Kids and adults can get into this app, which includes 50 lessons, over 1,000 words and up to 40 side quests. Available languages: Spanish, French, German, Japanese, Chinese (Mandarin) and Portuguese. Early Lingo French Language Learning for Kids blends vocabulary instruction, videos, digital worksheets and interactive games and activities together in a wonderfully-designed and aesthetically-pleasing app that welcomes your child in their early steps of French-language acquisition. Early Lingo have produced a clever-looking app series, which serves to make foreign-language learning both fun and interactive. Furthermore, it is well constructed and progressively builds upon prior activities to both reinforce knowledge and then challenge and extend its retention. This app boasts an impressive lexicon of well-over 450 words and phrases (according to the developers themselves) and, by welcoming native speakers on board to voice the audio, has brought an authentic feel to the learning and study processes. Most parents know the Little Pim videos, but the brand has a few apps to compliment the popular series, including PimTrack. The app allows you to create profiles for each child in your family, so you can monitor their progress as they flip through the virtual flashcards and learn new words, and you can even quiz them. Each flashcard has an illustration, a button to hear the word and the English translation. An engaging app offering an introduction to Chinese, specifically how to write and form Chinese characters. Aimed at younger children encountering Chinese for the first time, this app offers video introductions followed by guided practice. The app is designed to appeal to younger children, particularly those encountering Chinese for the first time, and the layout reflects this - presented with clear icons including both the name of the skill being taught and a representation of it. A very comprehensive French language app that teaches the language from the very basic age level right up to secondary age group. All the vocabulary and topics within the app are at GCSE standard. The aim of the app is to teach via learning drills and to learn the vocabulary off via memory in a consistent manner. The app reinforces the fact that revision of vocabulary and very conjugations is paramount to a successful communication level in a language. MosaLingua comes in a variety of languages for learning and practising with. MamaLingua is a language app designed for children who want to learn a second language Spanish or English. The app focuses on language parents use every day with their kids like vocabulary and phrases to use at mealtime, bath time, and during a long list of other everyday routines. It includes audio, text translations, and phonetics for more than 900 words in Spanish and English. Parents can use to learn Spanish and teach it to their young children. Vocabulary words and phrases includes text, phonetics and audio, and the app includes more than 900 everyday words and phrases divided into 18 categories. Includes both Spanish and English.